When most people say “I want to visit Tuscany” what they actually mean is that they want to visit Chianti. By many, the Chianti area is considered to be the most beautiful countryside in the world. Equally famous for its old-world charm and the boisterous and welcoming personalities of its residents as it is for its wines, it enchants every visitor with the beauty of its medieval hill-towns, castles, stone farmhouses and breathtaking vistas. All of these elements are blended with each other and with the rolling hills so harmoniously that it would seem that the whole area was designed from the ground up to be a tourist destination. The truth is that this glorious scenery and warm charm is just the result of centuries of cultural development. Listing all of the great things to see and do during Chianti day tours from Florence, Siena, Pisa, Lucca or Livorno would be impossible. There are over 450 wineries producing Chianti Classico alone and all of them are worth a visit. But there is much more to do than just visit vineyards. The area is also home to over 70 monumental castles, hundreds of medieval farmhouses and a dozen ancient hill-towns. The truth is that it would take a year to properly tour the area, or at least a week to hit the major highlights. We have made futile efforts to distill the best of Chianti down to a single day or half day experience for you and your traveling companions, but we cannot even come close to giving the area a just treatment in such a short period of time. We doubt that there is any other part of Europe that concentrates so much beauty in such a small territory, which does not even entirely fill the whole geographic region where it resides. Located just in-between Florence and Siena, the Chianti area is a treasure of natural and cultural wonders. Driving through the area with an expert driver or guide will allow you to discover and enjoy the most scenic routes. You will also be able to discover the quaintest villages, many of which remain almost exactly as they were in the 1300’s. The Chianti area is known for some of the best red wines in the world. Nothing is better during your trip to Italy than a visit to a real winery, so why not enjoy a taste of some of the best wine produced anywhere. Most of the wineries offer not only vineyard tours, but also a tasting of their most popular products. Among the must-try tastes are Super Tuscans, as well as Chianti Classico Riserva. The combination of the great wines and the stunning landscape make for a tourist experience that is unlike any other. During the course of the day tour that starts from Florence, Siena, Pisa, Lucca or Livorno, we may also visit the unique market square of Greve in Chianti. The square has remained as it was designed in the 15th century, and the old-world charm is perfectly preserved. You may visit the largest wine-tasting center in Italy, where each day you may taste over 100 different wines. From here we can also easily reach Montefioralle, Badia a Passignano, which are surrounded by vineyards and olive groves, or Castellina in Chianti with its fortress and guards’ walkway…but these are just some examples. Your driver, according to the wishes you express to him that you would enjoy the most, will adapt the itinerary, making this a truly unique and unforgettable day. 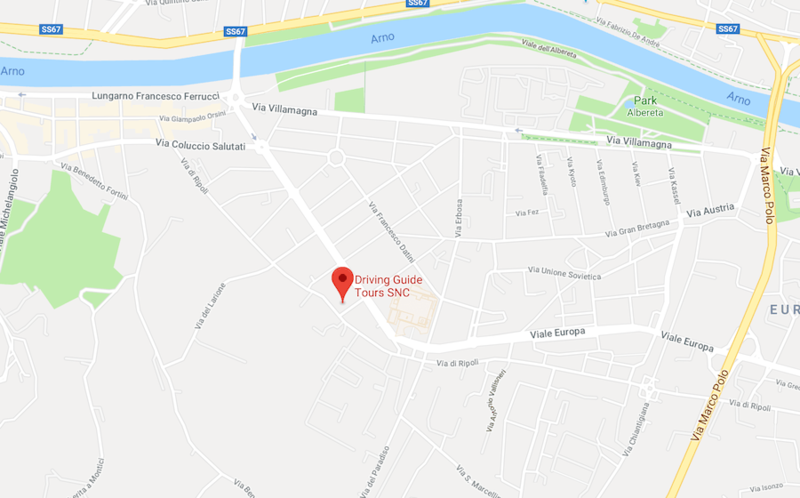 It is best for this tour from Florence, Siena, Pisa, Lucca or Livorno that you choose one of our luxury SUV vehicles, since there are some parts of Chianti that are not easily accessible by other types of cars and light trucks. While visiting Chianti, it’s important that you be able to balance the types of activities that you engage in throughout the day. While visiting wineries is a great thing to do in the region, there are lots of other activities to pursue as well. Wineries can be interesting, but limiting yourself to only doing that is quite boring, to be sure. But let’s take a look at an example of how you would balance the itinerary of your day trip to get the most out of the region’s offering. One could start by visiting a small family owned farm producing only 30,000 bottles a year using the most traditional old-style procedures, and continue with a world-renowned estate with over one million bottles produced with the most advanced and sophisticated techniques. While at each location, make sure that you engage in a wine tasting. By wine tasting, we mean stopping at a winery, whether the actual wine cellars or their wine shop and tasting several of their wines. Each tasting can take from 15 to 30 minutes. In most cases, a tasting is not something which requires making special arrangements for, unless of course, you want to taste wines from a specific estate that may require an appointment. By estate tour, we mean going to a specific wine estate and touring its premises, including fermentation plants, cellars and, in some cases, the actual vineyards and bottling plant. In some cases, you may even get a tour of the estate main house as well, if the estate is of historical significance. These tours are normally given by an employee of the estate or the owner for smaller wineries who explains the background and history of the estate, the peculiarities of their wines and how the wine is made, aged and sold. Finally, you also taste their products, but the tasting is normally the final 15-20 minutes of the entire visit which lasts from 45 to 90 minutes. If there are specific wineries that the clients want to visit, please give us details as some estates are very famous and without prior arrangements, it may be difficult to accommodate you. Also, please keep in mind that in most cases you can buy bottles and either take them with you to enjoy later in your hotel, or you can have them shipped home with all of the customs’ procedures taken care of professionally. It’s worth it to ship a minimum of 6 bottles, as long as you buy valuable wines. The cost of shipping is roughly 12 euro per bottle. Two or more of these visits in a day would normally get boring to an average person, who’s not a wine connoisseur. So, you can see why it is important to find other activities to add to your itinerary as well. Most of our guides and drivers are experts of good wine and consider themselves gourmets, as far they are concerned they’d have most fun if they could take client to wine tastings all day long, but they will also share the concept that going to Chianti does not only mean going to wine tastings all day long. While there is nothing theoretically wrong with that, Chianti does have a lot more to offer than just wine. The region is also known for its history, architecture, landscapes, as well as other products of the land ranging from olive oil to saffron, from aged meats to amazing artisanal cheeses. We often give Chianti tours to people who neither drink nor care much about wine, and yet they are often those who most enjoy the area. This is due to the fact that as they sightsee, they are doing so with their eyes better disposed to absorb the beauty and history of the land and culture at large versus just framing the area in the context of the wine production and tasting. In terms of routes, there are simply endless ways to tackle Chianti. An expert guide should be able to fill many days in this area, always helping the clients enjoy what they see without feeling that they are repeating their activities. The ability of a good guide or driver in an area such as this one is to always use different roads so as every traveled kilometer is a new experience. With that in mind, we recommend without exception the use of a driver guide versus just a driver or trying a self-driving tour. I want to thank you for such a wonderful vacation that my family had with your company. Our trip to Italy was one of the best we have experienced. That greatness was made in large part by the people that looked after us and toured us from place to place. I hope to travel with you again when we come back to Italy! I just wanted to say thank you for all of your help coordinating our travel throughout our stay. We absolutely loved each of our drivers and everything was truly perfect. We will sing your praises to any and all friends who may be traveling to Italy and I hope to use your service when we can make it back there ourselves! I was extremely satisfied with all aspects of our journeys from Florence to Siena and from Siena to Rome. The drivers and cars were excellent, the timing perfect and I would have no hesitation in continuing to book with you in future. Thank you for all the help with our transportation needs. Your team is so great! We had a wonderful day trip with our Driver Guide! He was polite, intelligent, considerate and extremely knowledgeable! We appreciate every consideration he showed to make our experience in Tuscany beyond our expectations. We will definitely recommend your company to our friends and use you again in future! I just wanted to say that our driver was absolutely exceptional!! Friendly, extremely safe, efficient, punctual and very accommodating... just above and beyond in every way. He had great recommendations too (restaurants, wineries, shopping, etc) We will 100% use your services again, and highly recommend you to our friends. Our transfers from airport and all other transfers were perfect. All of the drivers we had were absolutely brilliant, attentive and welcoming as well as being on time in every case. Thank you very much for making our holiday stress-free and enjoyable. Your company is just great, and we had terrific experiences!